The Cuban Amazon (Amazona leucocephala leucocephala) is generally considered by aviculturists to be one of the most beautiful of the Amazons. This is undoubtedly because of the striking pink colouration of face, throat and upper breast. After all, the closely related Hispaniolan or Salle's Amazon (A.ventralis) is almost identical except for the lack of this colour in its plumage. It has never attracted much interest from parrot keepers. The Cuban Amazon was a rarity in aviculture until the mid 1980's. Before then it had been less rare in Florida, due to the large numbers of Cuban immigrants who took their parrots with them. In Europe it was seldom seen until quite large numbers of birds were illegally imported into eastern Europe. Gradually these birds and their young filtered through to Germany and the rest of Europe. Despite increased availability, it remains one of the highest priced of Amazons. This is partly because of its beauty and also due to the fact that it is one of the more difficult Amazons to breed. While some pairs are quite prolific, other pairs are unproductive, or almost so. Wise management of Cuban Amazons is imperative. This is not a species for the inexperienced or for those who cannot spend much time with their birds. The aggressive nature of many male Cubans often brings problems which are not easy to surmount. One pair in my care in the breeding centre at Palmitos Park bred successfully for some years, usually rearing four young every year. In the first year the oldest of the four youngsters was killed by the male five days after he left the nest. In succeeding years I placed the male in a cage inside the aviary a few days before his offspring were due to leave the nest. He was not released until the youngsters were removed from the aviary. The ultimate fate of this prolific pair was very sad. One October day the male killed the female. In the wild some species of Amazons occasionally take a second nest, after the moult, presumably in response to favourable weather conditions. In captivity this is very rare. I can only assume that in the case of the Cubans in question the male wanted to breed again and the female was not ready. Unfortunately, this is not the end of that particular story. It was I who had picked up the female, dead, and I noted the form of her head injury. A couple of year’s later history was to repeat itself when a male bred by this pair killed his female in an identical manner. I think we tend to forget that parrots (like humans) inherit more than physical features from their parents. Personality traits are also inherited, especially aggressive tendencies. I have seen this in other parrot species. I firmly believe that it is detrimental to breed from aggressive birds. The number of breeding pairs of Cuban Amazons in the UK probably remains quite small. Some indication is given by members' records submitted to the Breeding Register of the Parrot Society. In 1992, one member reported breeding two young. In 1998 four members reported breeding a total of ten young. 1. Treat them rather like cockatoos. Install a camera and observation monitor so that the male's behaviour can be closely observed on a daily basis. 2. Discard aggressive males from the breeding programme. 3. Pay attention to compatibility between male and female. Don't expect good results from incompatible pairs. 4. Give breeding pairs sizeable aviaries, i.e., at least 15ft (4.5m) long (and preferably 20ft (6m) long), 4ft (1.2m) wide and 6ft (1.8m) high, with an enclosed shelter attached. 5. Do not pair a female under three years old with a mature male. The excitable nature of some male Cubans is evident at a very early age if they are hand-reared. Parent-reared birds may appear calmer but are just as likely to exhibit aggressive behaviour when they are older. While the precaution of cutting the flight feathers on one wing is often suggested to lessen the risk to the female, the danger is ever present as the female might be attacked in the nest-box. And do you really want to perpetuate the problem by breeding from aggressive males? The best way to form a breeding pair is to obtain two young birds. DNA sexing is recommended. There is a slight difference in the size of head and beak, these being larger in the male. Many parrot keepers believe that obtaining adult birds is a shortcut to breeding. In fact the opposite can be the case, especially with Amazons which have previously been mated. They can be very slow to accept another partner. On the other hand captive-bred females might lay in their third year although the commencement of breeding at three years old (i.e. in their fourth year) is more likely. The breeding life of males is long. In Florida, a male of the sub-species palmarum from the Isle of Pines, bred for the first time when he was 36 years old (For most of his life he had been kept as a pet). This bird belonged to Ramon Noegel, by far the most successful breeder ever of Cuban Amazons. Between 1974 and 1995, assisted by Greg Moss, they reared more than 400 Cubans. Four years ago all their Cuban Amazons were stolen in a raid one night. They were never recovered. But Ramon could not live without this species! From other breeders, he obtained offspring of birds he had bred, and now Ramon and Greg once more have a breeding programme for Cuban Amazons. Why have these two been so successful with this species? Basically because they can breed anything they turn their hand to, from giant tortoises (hundreds were reared before zoos had any idea how to breed them) and threatened species of iguanas to St Vincent Parrots. They have the understanding of what it takes to persuade any creature to breed. This is based on good husbandry and feeding, observation and empathy with the creatures in their care. Unfortunately, these qualities apply to comparatively few who breed livestock. I have often walked around his aviaries with Ramon Noegel while he recounted with pride and affection the parentage of the Cubans that he has reared through seven generations. Like most small Amazons, Cubans nest fairly readily. The clutch size is usually four eggs but varies between three and five. I usually recorded incubation periods of 27 or 28 days for the first egg; the last egg in the clutch might hatch after only 25 days. In the UK Cubans start to lay in April or May. A second clutch might be laid if the young from the first were not reared to fledging. Chicks weight about 10g on hatching and have fairly sparse white down. They are ringed at 14 to 16 days with a 9.5mm ring (UK size U). The youngest chick might develop more slowly, thus ringing would take place a couple of days later. The older chicks will reach adult weight of about 240g by 30 days. Young leave the nest aged between eight and nine weeks. On fledging they look similar to adults but usually have less pink and white on the head. In any case, colouration is variable in individuals, especially in the extent of pink which may reach far down the breast in exceptional birds. Amazons are seldom fussy about the type of nest-box offered. I think L-shaped boxes are more suitable for most parrots because they give a greater sense of security and, as eggs are invariably laid in the far corner, prevent birds from dropping down on to the eggs. For Cubans, a suitable size would be 16in (41cm) long, l0in (25cm) wide, nearly 16in (40cm) high and 7in (18cm) wide at the top of the L, and 9in (22cm)wide and (20cm) high at the lower part of the L. If an upright nest-box is offered this can measure approximately 12in (31cm) square and 3ft Sin (76cm) high. The nest entrance should be about 4in (10 cm) in diameter. Wood shavings or (as used in one European collection) a mixture of shavings, sand and soil can be used. Just a few days before writing this article I received a very interesting photograph from Czech aviculturist Jan Soyka. It showed a pair of Cuban Amazons, the male of which was described as a 'pink-breasted mutation'. His entire underparts, from throat to vent were pink, except for areas of green at each side of the upper breast. The female was normal. The pair has already bred three young, now two years old, with the underparts pink. I wonder whether this is actually a mutation or has been achieved by selective breeding. After all, in the Czech Republic, Cubans have been bred for some years longer than in the UK. Whatever the origin, this male is startlingly beautiful. In another collection in the Czech Republic, that of Vladimir Matejka, an olive green Cuban was reared in 1991. A female, she was paired with a normal male and, in 1994, laid her first egg. One of the two youngsters was olive-green. In 1995 the female laid five eggs. All hatched and two of the young were olives. The most beautiful Cuban I have ever seen is a male hatched by Ramon Noegel and Greg Moss in 1994. The pink of the upper breast reaches from the throat to the middle of the abdomen where it meets the dark red area. I saw the great grandmother of this male in Ramon's aviaries in the 1970's. She had a long, narrow streak of pink stretching down her abdomen. Like all Amazons, Cubans need a low-fat diet, i.e. one without too much sunflower. They easily become overweight if given too much of this seed. As the basis of the diet breeding pairs should receive either a seed mixture specially formulated for Amazons, or a parakeet mixture with small sunflower seed added. If kept outdoors during the winter, a little extra hemp and sunflower can be added to the mixture. In addition, they need fresh fruits and vegetables on a daily basis to form at least 30% of the diet. Readily eaten fruits are apple, pomegranate, orange, grapes, papaya, cactus fruits, guava, passion fruit and banana. Peas in the pod, green beans, carrot, celery, fresh corn, beetroot and courgettes are the most favoured vegetables. Thawed frozen peas and sweet corn can also be offered. In preparation for the breeding season, cooked pulses (beans, lentils, etc) can be added to the diet, also cooked lean meat, including chicken on the bone. This boost in protein helps to stimulate breeding condition. Small cubes of cheese can also be offered in moderation (cheese is high in fat). A good rearing food is Parrot CeDe, to which some mashed banana and finely chopped orange or grapes has been added. How do breeders in eastern Europe feed their Cubans? In the Czech Republic, Vladmir Matejka is a successful breeder of this species (Vit, 1996). To stimulate them to breed their food consists of a mixture of sunflower, hemp, millet and oats, various nuts, fruit (apple, pear, oranges), carrot, green peas, green food such as chickweed and dandelion, also lettuce (which has little food value). The diet is supplemented with seasonal extras such as the berries of mountain ash, raspberries, strawberries, rose hips and blackcurrants. (In Europe rose hips are widely used for feeding parrots.) A rearing food is made from hard-boiled egg and 'rusks; corn cobs and sprouted sunflower are also offered when there are young in the nest. As a genus, Amazons are not very susceptible to feather plucking but Cubans might be an exception. Of the forty or so Cubans in my care at one time, two were badly feather plucked. Even Ramon Noegel's collection was not free of this condition. On one occasion I noticed two in the young bird aviary which were badly plucked. Greg Moss told me that they were sisters. One morning several weeks previously, after a cold night, both simultaneously removed their breast feathers, leaving only the down. Can plucking be cured? In some individuals, yes. In California, my friend Tigerlily Jones bought a male who had been in a pet shop for three and a half years. He was badly plucked. She caged him next to her female and observed them carefully. After two weeks she put them together in an indoor cage. On occasions she had to separate them because the male was aggressive towards the female. After five years the female laid. Two chicks hatched and were reared by the pair until removed for hand-rearing, at the age of two weeks. While rearing the young, the male stopped plucking himself. The Cuban Amazon is currently listed on Appendix 1 of CITES which means that birds cannot be sold without the appropriate papers from the DETR. It also means that this species is considered to be 'near threatened' but not endangered enough to feature in the recently published 'Parrot Action Plan'. It is still fairly common in some remote forested areas of Cuba and occurs in some national parks. However, the population is declining. The last estimate, in 1988, suggested that only about 5,000 birds remain. In 1995 the sub-species palmarum from the Isle of Pines (Isla de la Juventud) had an estimated population of 1,400 birds. It is interesting that Nigel Collar, author of the parrot section volume 4 of Handbook of the Birds of the World, does not recognise this sub-species. It was separated on account of its supposedly richer colouration, deeper pink on the throat, more extensive white on the crown and more pronounced vinaceous on the abdomen. In head colouration they are inclined more towards bahamensis from the Bahamas. I acknowledge that the degree of pink and vinaceous colouration varies considerably in specimens of the nominate race, even among nest mates. In the September 1997 issue of the German magazine Papageien there is an excellent photograph of a pair of palmarum at their hole on the Isle of Pines. This clearly shows that, at least in the male and female depicted, the white on the crown extends backwards further than in birds of the nominate race. Xiomara Galvez Aguilera from Havana observed this Amazon in the Los Indies region of the Isle of Pines in savannah studded with palms and pines. Formerly, this island had a large population of Amazons. It was dramatically reduced by trapping. Here they nest between March and July in the barrel palm (Colpothnnax wrightii). This palm is urn-shaped near the base and makes an excellent nest site, except for the fact that the nest entrance is usually just over 1l ft (3.5m) from the ground which must make the nest very easy to rob. However, it seems that the situation improved during the 1980's. Between the years 1979 and 1986, Cuban Amazon numbers doubled in Los Indies. In 1980, 34.8% of the parrot population was hunted or killed, as against 4.8% in 1985. 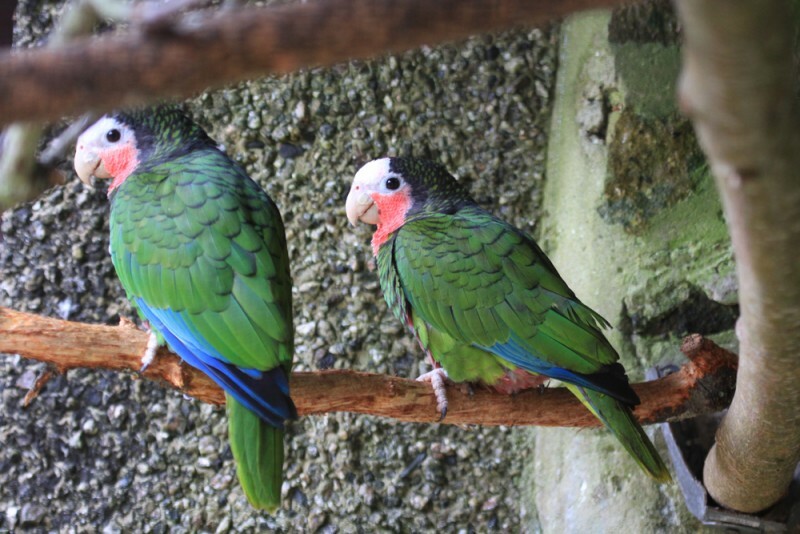 During the past century, the parrot population on Cuba and the Isle of Pines declined dramatically due to loss of habitat and trapping for food and for pets. This trend will continue as more habitat is destroyed. Aguilera, X.G., 1997, Erfolgreicher Schutz derWestliche Kuba-Amazone, Papaageien (9): 278-281. Vit, R., 1996, Zuchterfahrungen mit der Kuba-Amazone, Gefiederte Welt (12) 406-407.